From Sacramento: Mitchell Chareunsouk's parrot has been stolen. 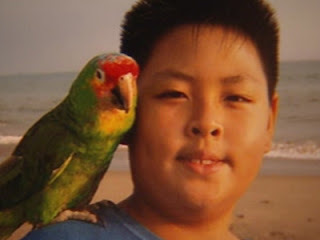 SACRAMENTO, Calif. - A Sacramento boy with autism and his family are asking for the safe return of his parrot, Rainbow. Toune Chareunsouk, the mother of Mitchell Chareunsouk, said her son's feathered friend was stolen last week. "Every time he (Mitchell) sees the picture he cries, and he doesn't want to eat," Toune Chareunsouk said. Mitchell got Rainbow three years ago and would just like to see his best friend again. If you live in the Sacramento area and know anything about this, please contact me. Asperger Square 8 is offering a reward for the safe return of Rainbow to the Chareunsouk family. To the person who took the parrot: Please reconsider. Parrots bond very strongly with their people, and Rainbow will be miserable without Mitchell. If you were planning to sell this parrot, know that Rainbow's picture is being widely distributed. If you have purchased the bird from someone, please contact me and I will arrange to get your money back when the parrot has been positively identified as Rainbow by the Chareunsouks. Any parrot lovers or persons with an interest in autism who are able to contribute to the reward funds for Rainbow's return, please email me. I hope they are reunited very soon. That's horrible. I would be devastated if someone stole my birds. I hope that these two friends can be reunited. Terrible. This should be considered kidnapping, IMHO. Very sad. I wonder how it was stolen. Seems a tough thing to steal. I hope he is returned! I am heartbroken for them. I want the person who has Rainbow to please understand the wonderful thing you can do by contacting this blog so the heart friends (boy and bird) can find each other again. Nobody will treat you as a thief. It doesn't matter how you got this bird --you will be a hero for hearing this message and letting the boy and bird reunite. Please come forward.